Martin's Tavern | This family-owned restaurant is practically a Georgetown landmark due to its impressive history. John F. Kennedy even proposed to Jackie in one of the booths! 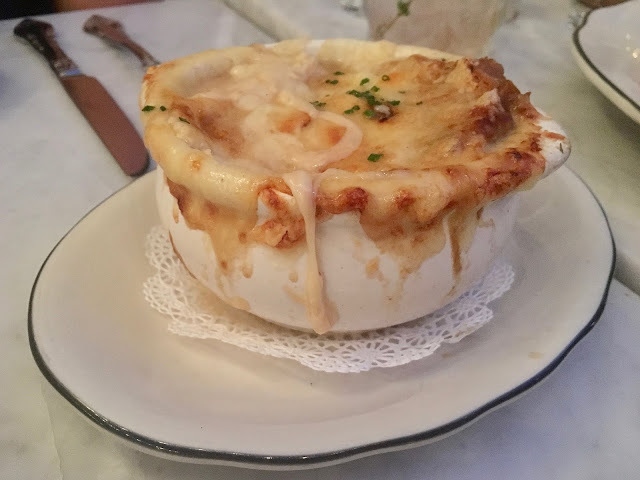 You can't go wrong with the shepherd's pie. Filomena | Hands-down the best Italian food I've ever eaten. The family recipes and the "pasta mama" who hand makes the pasta in the front window lend to the authentic feel of the place. If you go to one place on this list, make it Filomena. But be sure to make a reservation pretty far in advance! 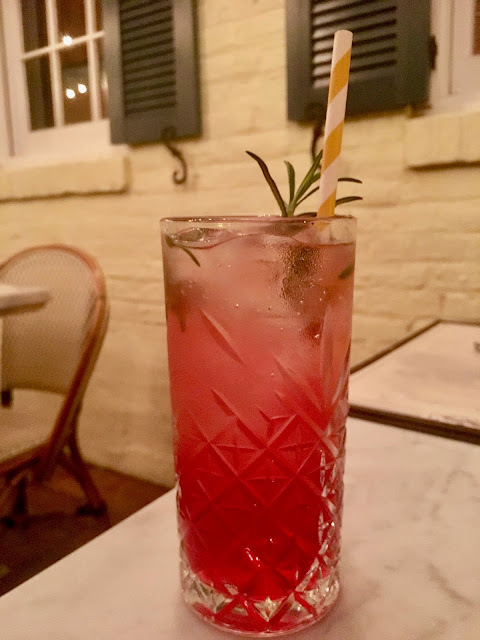 The Tombs | This could've easily been included under "Georgetown Student Favorites," but, as one, it has also become a classic Georgetown restaurant. The Tombs, like its name implies, is an underground restaurant and bar only a block from Georgetown's campus. Monday nights are bustling due to the half-priced burgers, and students celebrate their 21st birthdays with a "Tombs night." Falafel Inc | This tiny space modeled after a refugee camp might just be my most visited restaurant on this list. With $3 falafel sandwiches and to-die-for pita and hummus, it's no wonder it always has a line out the door. It's well worth the wait though, as the profits go to feed refugees around the world. Not to mention they play some major throwback jams while you wait! &pizza | &pizza is the classic create-your-own pizza place that every college town needs. And the fact that it's open until 4am means it's perfect for late-night cravings! Mai Thai | As with anywhere that offers free food, Mai Thai is popular with college students. Their "Eat Free on Your Birthday" deal has created a fun birthday tradition of eating out with friends. Wisey's | This list wouldn't be complete without Wisemiller's Grocery and Deli, the go-to sandwich spot just off Georgetown's campus. Wisey's is famous for their Chicken Madness sandwich, though the Chicken Parm is my personal guilty pleasure. Kafe Leopold | My go-to avocado toast in Georgetown is Kafe Leopold's. It's simple but delicious and served with a side of bacon, which makes this chic place an obvious favorite of mine. Boulangerie Christophe | Boulangerie Christophe is a recent discovery. While it first appears to be just a little French bakery, it also has a full sit-down restaurant upstairs. On a sunny day, grab a bite and catch up on work on the expansive back porch. South Block | South Block is too expensive to frequent on my college student budget, but, if you're a smoothie bowl fanatic, it's a must-try. Plus, the fun environment is ideal for studying with friends. 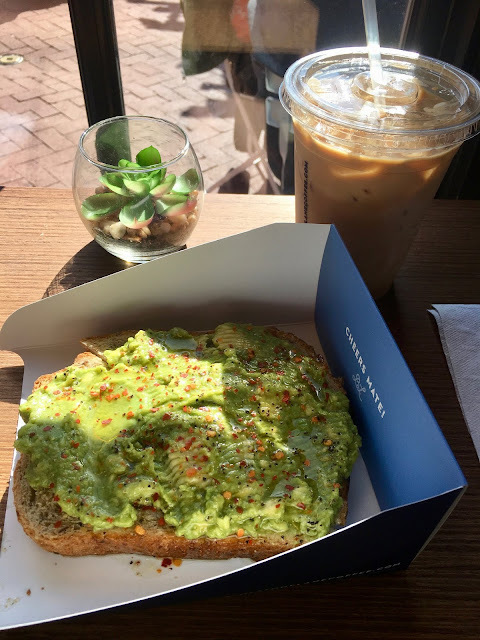 Bluestone Lane | A new addition to the Georgetown neighborhood, Bluestone Lane is an Australian coffee shop with a short menu and quick service. Their Georgetown location is tiny--more of a grab-and-go than sit-down style--but still worth visiting. 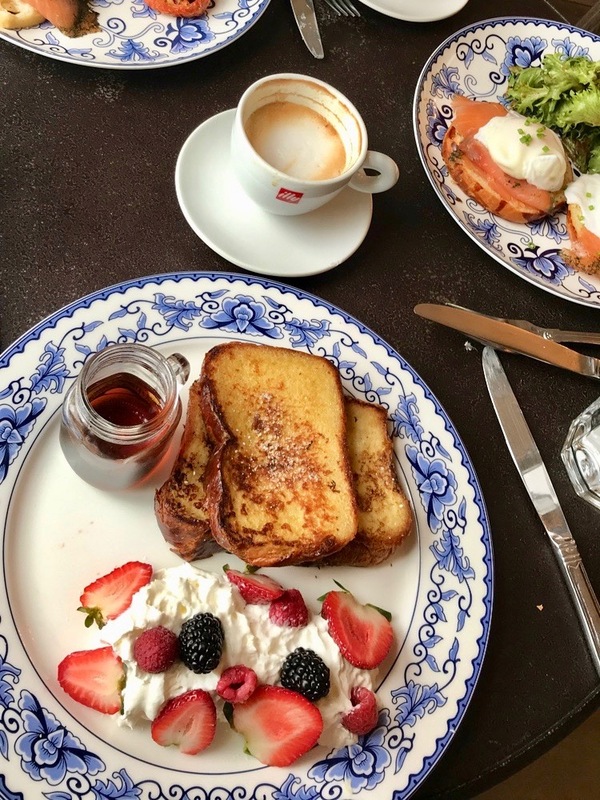 There is also a Dupont Circle location that is more of a café than coffee shop. Farmers Fishers Bakers | Located on the Georgetown Waterfront, Farmers Fishers Bakers is popular due to its lively atmosphere and menu that offers a little but of everything. It's a smart choice for groups, as there is truly something everyone will like. I've also heard rave reviews about their weekday brunch but have yet to try it. 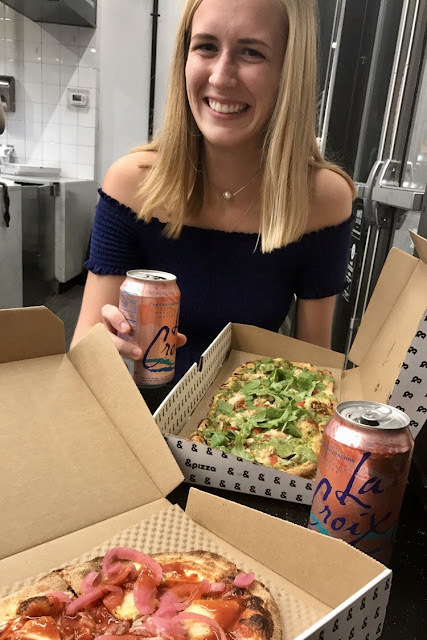 Union Market | Union Market is the perfect solution if your family (or friend group) is anything like mine, meaning it has trouble agreeing on a place to eat. The market hosts a bunch of vendors with all sorts of different foods. Some of my favorites include the empanadas and Korean tacos, but you can visit the page I linked for a full list, including the current pop-up shops. Good Stuff Eatery | Good Stuff is nothing fancy, but it serves a solid burger and fries. Heck, get a milkshake while you're at it. Only go if you're hungry! 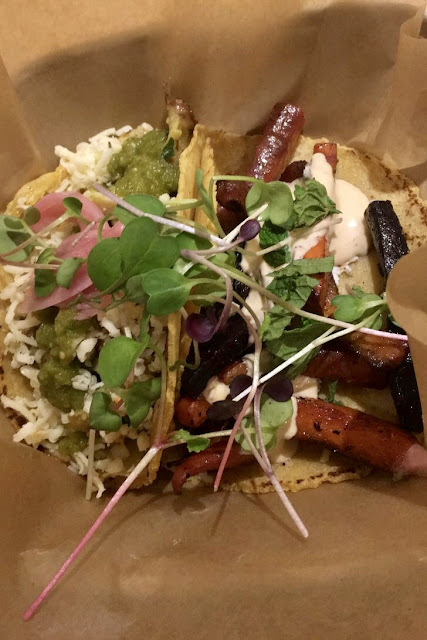 Chaia | Chaia has reimagined the taco, using only plant-based ingredients. I was hesitant to try it, but let me tell you, the flavor is insane. Check it out if you're looking for something hip, healthy, or just different. Pizzeria Paradiso | Go for the pizza, duh. It's authentic, I promise. *My lunch suggestions do not serve only lunch, but that's what I prefer them for. Il Canale | Il Canale makes good pizza and knows it. Greeters even hand out samples to passersby in order to lure them in! However, if pizza isn't your thing, I assure you they have plenty of other delicious Italian dishes to choose from. Their lasagna is another one of my favorites. Paolo's Ristorante | Paolo's is another much-loved Italian place. However, even more than anything on the menu, I dream of their bread. If the weather is nice, I highly recommend sitting on the porch and people-watching on Wisconsin! El Centro | A fun, lively Mexican restaurant with to-die-for guacamole. Need I say more? Thunder Burger | Thunder Burger is the place for an elevated burger. Its trendy, lively atmosphere makes it a great place for a date night or night out with friends. Chez Billy Sud | Chez Billy might just be my new favorite Georgetown restaurant. Its quaint courtyard, complete with market lights, feels like it is situated in the heart of a French town. The food is just as lovely, and it is definitely worth ordering a few courses. Momofuku | I fell in love with Momofuku the first time I visited Georgetown and am still quite a fan. I recommend doing family-style sharing so you can taste a bit of everything. You can't leave without ordering dessert from the neighboring Milk Bar; the crack pie with cereal milk ice cream is my absolute favorite (my parents even had it shipped to Florida for my birthday last year!). Momofuku is located downtown in CityCenter, not in Georgetown. Let me know if you'd be interested in more of my D.C. favorites, and I'll make this into a series! Which other restaurants must I try?